O Juanatey-Boga, V A Martínez-Fernández, M Rodríguez-Castro (2018): “The Two-Speed Europe reflected in Public Service Media Funding: a budget based analysis”. Revista Latina de Comunicación Social, 73, pp. 1054 to 1071. Introduction. European Public Service Media (psm) faces today challenges regarding innovation, legitimacy and funding. This paper analyzes the evolution of European psm funding between 2010 and 2016, considering its need for legitimization and update of the different funding models within the eu. Methodology. We analyzed the evolution of the budgets of the European psm in relation to inhabitants, households and gdp in terms of purchasing power parity. Results. The results confirm the impact of the economic crisis on the budgets of the European psm. Two triennials can be identified: the first one (2010-2013), marked by budgetary constrictions (-4.1%), and the second one (2013-2016), which shows a slight recovery (4%). We also highlight the differences between Northern and Southern Europe. Conclusions. Ultimately, we conclude that a reformulation of the European psm business models is required in order to achieve greater stability, adequacy and legitimacy. 1. Introduction. 1.1. The challenges of public service media in the digital environment. 1.2. Funding models of the European public service media. 2. Methodology. 3. Results. 3.1. Funding by country. 3.2. Funding per capita. 3.3. Funding in relation to households. 3.4. Funding in relation to the economies size. 4. Conclusions. 5. References. The European Public Service Media (psm) has been facing emerging challenges for decades, forcing it to reflect on the role it plays for society as a whole in order to be able to adapt to a changing and unpredictable environment. Some of the most recurring problems that arose in the 1990s, related to triple crisis of identity, funding and operational problems (Achille, 1994) are still part of the current list of challenges mustered over the last years, derived mainly from the adaptation to the new digital ecosystem, which Bardoel and Ferrell Lowe (2007) named as the transition from Public Service Broadcasting to Public Service Media. The current main challenges faced by the governance and the activity of psm are concentrated on the fields of innovation, legitimation and the crisis of the different funding models that can be found in Europe. The former is manifested, for instance, in the emergence of regulatory mechanisms such as the public value tests, used to decide on the approval of psm new services proposals, mostly related to new media, in an attempt to legitimize their pioneering activity in the field of innovation (Moe & Donders, 2011, Rodríguez-Castro, 2017). The efforts of psm to continuously renovate their legitimacy in front of their different stakeholders have been greatly influenced by the pressures ejected from the media private sector. One of the most raised arguments by private media is the obsolescence of the market failure logic: a non-regulated, purely commercial audiovisual market would lead to market failure, a situation where some majoritarian tastes would be overrepresented, while minority or less attractive content to the public would be underrepresented (Brown, 1996). This lack of content would justify the existence of psm. Even though the market failure argument seems to have been sidelined, the truth is that it is still part of the current debate around psm, with regard to the transformations derived from the volatile digital environment, where the offer (both free and paid for) multiplies and, at the same time, it is personalized, paving the way for psm critics. In Ireland, during the celebration of the Forum on Broadcasting in 2002, the private sector lobby stated its willingness to marginalize the activity of rté regarding matters of audience, content and funding (Coppes & Saeys, 2006), limiting the Irish psm organization to those sectors that could not be reached by private media. On the other hand, this rhetoric also came to light during the Royal Charter renovation process in 2015. Justin Lewis (2015) criticized the new assumed position of the public consultation document elaborated by the Department of Culture, Media and Sport, as it returned to the market failure argument to consider the possibility of modifying the bbc’s public service mission and public purposes in order to focus its activity in specific, underserved audiences (Department for Culture, Media & Sport, 2015). Likewise, the supporters of psm have responded to the attacks targeted at the reduction of its activity by employing, among others, the value for money argument (Hultén, 2003). Ferrell Lowe and Berg (2013) have analized the economic data of the main European public service broadcasters and, after contrasting this data with the results obtained by their private counterparts, they have concluded that the former leverage their budgets better than the latter, thus refuting the overcompensation argument of psm critics. Moreover, this performance is not measured just in economic terms, but is also conceived as the creation of social and public value (Crespo, Martínez & Campos, 2017). Consequently, the social benefits that must be provided by psm come along with other economic benefits, such as the contribution to a national audiovisual market or the promotion of innovation and talent (Bardoel & d’Haenens, 2007; Ferrell Lowe & Berg, 2013; Bonini & Pais, 2017). After the protests of the private sector were brought to the European Commission in the 1990s, the Commission had to mediate the conflict between critics and supporters of psm in the digital context. Thus, the Commission applied its competency principles to broadcasting policy (European Commission, 2009), at the same time that it put pressure on Member States to legitimize its psm organizations through the adaptation of their public service mission to the new digital ecosystem, as well as through increased accountability to their main stakeholders (Donders, 2010). The protests of the private lobby, which, as we have pointed before, have been taking place for two decades, were intensified by the 2008 economic crisis. The impact of the recession on the advertising market was drastic, and print media outlets found themselves among the most affected sector (Juanatey, Martínez & Castellanos, 2017). On the other hand, within a context of advertising income decrease, digital media experienced an increase on this kind of income (Ferrell Lowe & Berg, 2013). This shift of advertising revenue triggered all the alarms in print media outlets, which then started to transfer their activity to the new media. Public service broadcasters where then undergoing their own process of creation of their online space, in a quite successful way, which was understood by private media as a drawback for their digital transition and detonated a new wave of protests to the European Commission. To this continuous legitimation questioning of psm, we must sum up the crisis that their diverse funding models are undergoing. The digitalization process of public service broadcasters overlapped with major budget cutbacks as a consequence of the economic crisis, as well as with greater demands for transparency in resource management (Moe, 2011). Despite the diversity of funding models present in the European public media system, all of them were impacted by the recession, leading to an ongoing debate around the future of public service media funding. One first approach to the different funding models can be drawn from their sources of income. In their study, Ferrel Lowe & Berg (2013) have identified four main funding sources in European public service media organizations: licence fee, direct subsidy, advertisement and a subscription and pay-per-view system, to which we should add another commercial income streams such as the commercialization of broadcasting rights. While the two first sources are conformed out of public funding and thus favor an orientation of the organization towards citizens; the last two income sources shift the balance towards a consumer orientation. Moreover, the excessive weight of commercial income can lead to a greater impact on the general budgets, due to the decrease, for example, of advertisement revenues, especially in times of crisis. Ramsey (2017) points at this situation in the Irish scenario, as in this country television advertising revenues dropped 10% between 2007 and 2013, while in the last years digital advertisement and sponsorship have also decrease a 11%. Licence fee, with its different variations, is nowadays the most extended funding source in Europe. This system provides more stability, it is perceived as a transparent income stream and increases the duty to be accountable to citizens. Even though the licence fee is not exempt from problematics such as evasion rates (O’Hagan & Jennigns, 2003; Ramsey, 2017), it does count with a better reputation than direct subsidy. A funding model based on direct subsidy can be more vulnerable to political pressures, affecting both psm editorial content and their budgetary stability, more subjected to the determination of the government in power. The differences between both systems can be exemplified by the case of the Netherlands, where in 2000 the licence fee was replaced by a new model based on direct public subsidy (Benson & Powers, 2011), a change that led to a major drop in npo’s budget during the first implementation years and which was questioned because of the increase of vulnerability and the decrease of stability. The ongoing changes affecting European psm funding systems can be studied on the basis of the typology proposed by Berg & Lund (2012). These authors list three different political approaches to psm: 1) the market-oriented model, characterized by the outsourcing or commissioning of services; 2) the conventional model, marked by in-house production and self-management; and 3) the competitive model, in which psm compete directly with their commercial counterparts. The market-oriented model is gaining ground in an environment which has traditionally been the kingdom of the conventional model. In Denmark, for instance, exists a combination of these two models, affecting the way the licence fee is being managed and allocated, as it is not only used to fund the Danish public service broadcaster, the DR, but also other commercial initiatives, such as the regional services of tv2 or the radio 24syv. The licence fee is actually one of the most discussed issues within the debate on the future of European public service media. The charge of a licence fee on the grounds of the ownership of one television set constitutes nowadays an obsolete idea, considering the new consumption ways (Herzog & Karppinen, 2014). The future of the licence fee is being defined by three alternative options (Nissen, 2006): its expansion to all kinds of devices that can be used to access psm content, as it happened in Sweden; its complete removal, being substituted by direct subsidy (the Netherlands); or its conversion into a special tax applicable to all citizens or household, an option that has been implemented in Germany and Finland. In other countries, such as Ireland, the social and political debate is still taking place. The reflections on the current situation of the licence fee have also led to innovative proposals, such as the one by Bonini & Pais (2017), who pose the idea of merging this traditional funding source with crowdfunding strategies, allowing citizens to choose in which programs to invest a quota of up to a 20% of the licence fee rate. This idea would entail an increase in structural participation of society in the management of its public service media organizations. The European Broadcasting Union (ebu) has recently published a report where four essential principles for the funding system of psm organizations are established: the stability and suitability of the budgets; independence from political interferences; fairness and grounds; and transparency and accountability to the citizens (ebu, 2017). If those four criteria are met, the funding system of this psm organization would contribute to its legitimation and to its consolidation as the media spaces with the greater autonomy and independence from external influences in the whole current media ecosystem (Karppinen & Moe, 2016). On balance, in order to achieve strong and legitimated psm organizations, an appropriate funding, able to adapt to the volatile context, is required. This paper is embedded in the studies on funding, regulation and legitimation of the European public service media system, by analyzing the budgetary data of the psm organizations of the 28 member States of the European Union between 2010 and 2016. Besides the theoretical approach that was described in the previous preceding paragraphs, in order to develop this research, we have also analyzed the financial data of all the European public service media organizations from 2010 to 2016, retrieved from the European Audiovisual Observatory’s database (eao, 2017). This information has been complemented by the publications of the European Broadcasting Union and the annual management reports of the psm organizations, which in some cases have been used to obtain missing data. Thus, we opted for a research design based on the temporal analysis of three variables (total revenue, public revenue and other revenue) in the 28 Member States of the European Union, conforming a descriptive statistical analysis that allows for the comparison of the behavior of the different territories regarding the funding of their public service media. In order to sharpen the comparative analysis of the different funding models and countries, it was necessary to ponder the revenues of each of the organizations and countries with respect to the population, households and Gross Domestic Product in terms of Purchase Power Parity (gdp/ppp), making use of the data retrieved from the Eurostat, because of its absolute acknowledgement within the research community and its official character. Thus, revenue data of European psm were crossed with other socioeconomic variables that define each country for all the years of the period studied (which correspond to the years of the present decade with available data), allowing for the accurate identification of the current situation and trends on the funding of public service media in the European Union. The first issue that was noticed after analyzing the data from the funding of European psm was the fact that these organizations have been subjected to and influence by economic variables and upheavals experimented by the economies of their territories and, therefore, it can be appreciated the impact of the economic recession that acutely stroke Western economies during the last years of the past decade and the beginning of the current one. Nevertheless, as the results that we will expose in this paper show, it should be pointed out that the behavior of the studied countries during this period presents relevant divergences regarding the funding of its psm system and the impact of the economic crisis. Because of this, after a first aggregated analysis of the data of the European Union, it is absolutely necessary to formulate a deeper analysis of the data of all the studied countries. Source: personal processing of eao data. 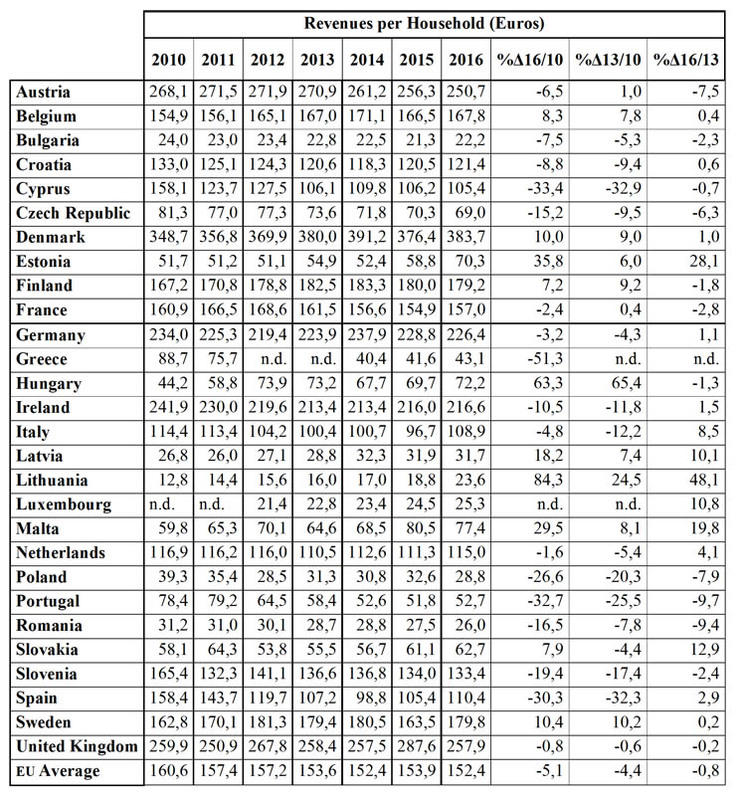 An initial approach to the evolution of the budgets of the European public service broadcasters during the current decade, reflected in the data from 2010 and 2016 in Table 1, leads to thinking that during these years a period of absolute stability took place, as the total revenues only varied a miniscule -0,3% from 2010 to 2016; in other words, this revenues practically remained unchanged. However, this apparent stagnation hides an evolution with two differentiated stages. The first one was a three-year period of continued drops on psm funding, with an income decrease of 4,1% from 2010 and 2013. This was followed by a growth of a 4% in the next three years, from 2013 to 2016, an increase that redressed the previous economic contraction, returning the funding volume practically to the initial conditions. If we pay attention to the breakdown of the data retrieved from the eao between public income and other income, where the first item refers to the funding received through the different establish mechanisms for the provision of funds for public service broadcasting, and the second one encapsulates primarily commercial income sources, such as advertisement, sponsorship, the sales of their own content, and other similar revenues: we find a similar situation as the one shown by analysis of the aggregated data, although it should be pointed out that in this case the major drop that affected the variable conceptualized as “other income” in the first three-year period, of more than a 12% decrease, has not been corrected in the following three years, where the increase was only of a 7,7%. This was a consequence of different factors, including the fiercer competition for the advertising pie, as well as other entrenched phenomena, such as the Internet, and others in ongoing development, such as on demand platforms like Netflix or hbo. In order to compensate this situation, public income have experienced in the last three years a funding improvement (2,9%) which softens with certain margin the previous drop in the first triennial analyzed. A second approach to the analysis of the funding of public service broadcasting in the European Union demonstrates the rise of diverging behaviors between countries in the evolution of such funding during the past years, as reflected in Table 2 and Graph 1. Thus, the numbers clearly show the trend that is also present in other fields and sectors, and which has been named as the two-speed Europe (European Commission, 2017). On the one hand, the countries of the South of Europe, mostly, have experienced a greater convulsion during the financial crisis, in some cases even needing the so-called “rescues” from the European Union and the International Monetary Fund (imf). In this group we include countries such as Greece, Spain, Portugal, Cyprus and even Italy and Ireland (which was also rescued), as well as most of Eastern Europe countries, such as Poland, Romania, Bulgaria, Czech Republic and Croatia or Slovenia. All these countries registered drastic cutbacks on the funding of their public service media organizations in the analyzed period, with major percentage drops which in many cases reach double-digit decrease, and are unable to be redressed with the generally modest increase of the last years, except maybe in the case of Italy, a country that in the last year of the study, from 2015 to 2016, has experienced a mayor revenue increase. On the other hand, the so called Northern Europe, including mainly the Baltic and Scandinavian countries (Lithuania, Latvia, Estonia, Sweden, Denmark, Finland and Belgium) have modestly increased the revenues of their public service media organizations during the last years. Other countries with powerful economies, such as Germany, the United Kingdom and France, have also experienced certain growths in psm funding, although in a subtler way. Behind the abovementioned figure of the practically null variation value for the European Union between 2016 and 2010, which seems to show a near-absolute stability, lies the absolute imbalance between the behavior of this two kinds of country profiles subjected to be typified within the European Union: Northern Europe vs. Southern Europe. This represents, as it has been already pointed out before, the two-speed Europe, also in the field of public service media funding. Thus, according to Graph 1, the variation on revenues of the European Union captures a practically null value, with a certain centrality on the graph (practically half of the countries are placed above the average, while the other half is placed below it), although it can be noted how countries like Greece, Portugal, Spain or Cyprus present cutbacks above 25% (above 50% in the case of Greece), even if, as it has been already pointed out, they have experienced a slight increase during the last years. However, this is not enough to mitigate the important drop that took place during the years of the financial crisis, which hit those countries the hardest, forcing them to establish austerity policies that have had a major impact on the funding of public service media. Once the global figures of psm funding in the European Union have been analyzed, it is key to contextualize them in relation to a number of characteristics of the studied countries. It is essential to relativize the data in terms of the population of each country, as it seems logic to think that population size constitutes a factor somehow conditioning the funding of psm. Thus, weighing the figures in relation to inhabitants can contribute to a better understanding of which countries make greater efforts regarding their public service media organizations. In this regard, as an average figure, public service media organizations in the European Union had 65,7 euros per inhabitant available in 2016, approximately 1 euro less (66,9) of the amount at their disposal in 2010. This figure has remained quite stable during the past six years, fluctuating around 65-66 euros, as it is reflected in Table 3. That said, this average figure portrays an important dispersion of the budget per inhabitant that the different psm organizations have at their disposal in each of the studied countries, thus reflecting the major differences in their revenues per capita. 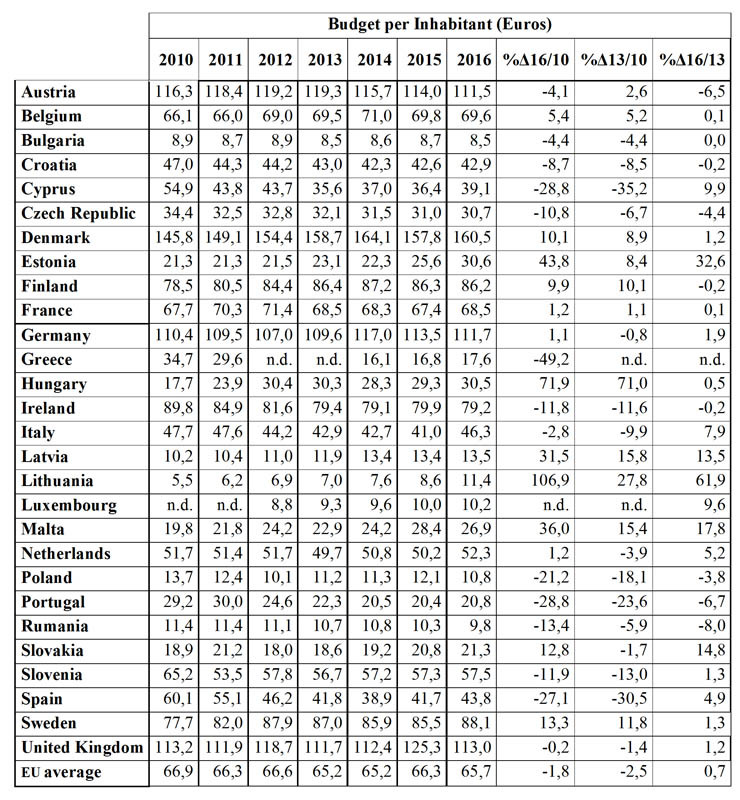 Source: Personal processing of data from eao and Eurostat. Again, the so-labeled Nordic countries (Denmark, Sweden and Finland), as well as the two largest European economies (Germany and the United Kingdom) show values way above the European average. As opposed to this trend we find cases like the ones of Spain and Italy. 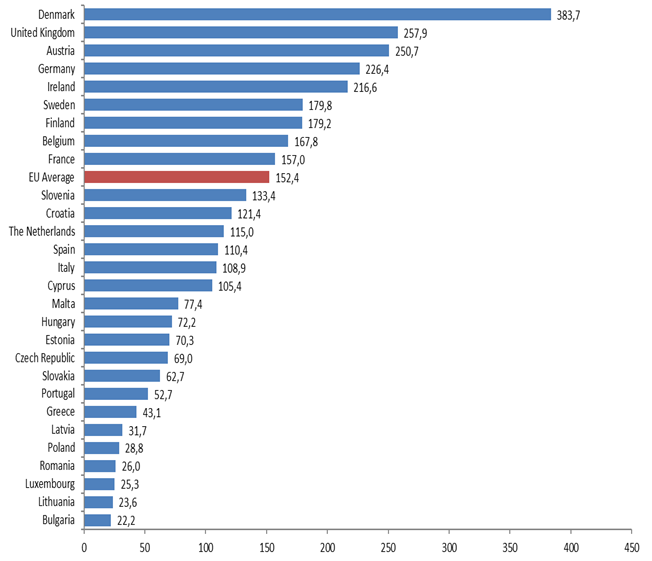 Despite being the fourth and fifth economic powers of Europe, their psm funding per capita figures are found way below the European average, as it is shown in Graph 2. In fact, in the case of Spain, there has been a drastic drop from the 60 euros per inhabitant in 2010, very close to the European average, to less than 44 euros in 2016, just one third of the corresponding European average. 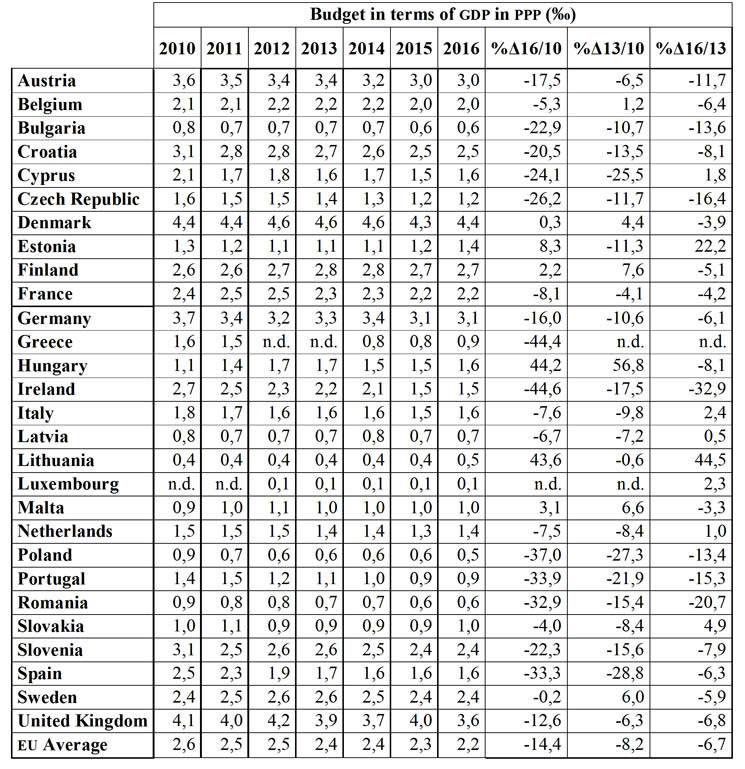 It should be noted, according to Table 3, that the sharper declines in budget per inhabitant took place between 2010 and 2013, a period during which countries such as Spain, Cyprus, Poland, Portugal, Ireland or Italy experience a major reduction, leading in most cases to a new stage of stability or even slight growth in these values. When approaching the analysis of public service media funding, it is necessary to relativize the figures according to the number of households inasmuch as the concept of the household has been used as a tax subject, since it has been traditionally considered that this is the space where the consumption of television content usually takes place. Thus, for the analysis of the funding evolution of psm between different countries and the establishment of comparisons, it is essential to consider the number of households in each one of them, in order to accurately weight the budgetary volume available to fund psm organizations. Still, the questioning that the concept of household as a tax subject for the licence fee is undergoing cannot be ignored, as the irruption of multiplatform, multiscreen content, whose consumption does not rely on a specific localization, is challenging the traditional household-based consumption model. In this regard, Finland was pioneer in the adoption of a tax system based on the individual instead of in the household, even though nowadays most countries with a licence fee model still consider the household as the main axis for their psm funding model. That is why household figures are deemed to be relevant in the analysis of the different countries of the European Union. According to the data shown in Table 4 and Graph 3, the average revenue per household for psm funding in the European Union was 152 euros in 2016, slightly under the 160 euros per household that European psm organizations had available at the beginning of the decade. Nevertheless, severe polarization between the countries are hidden behind this average figure. The countries deemed to have the most advanced, strong economies in Europe, such as the Scandinavian countries, Germany, the United Kingdom, France or Belgium show values above the 50% of the average, while less powerful countries from the East and the Mediterranean basin, including even Italy and Spain, despite being the fourth and fifth most important economies in Europe, show values of psm funding way below the European average, in both cases around 110 euros. In the case of Spain, this figure is far from the almost 160 euros per household that the psm system received in 2010. It should be highlighted the confirmation of how the countries with greater budget cutback of the analyzed period are among the most affected ones by the financial crisis. Therefore, Greece, Portugal, Spain and Cyprus show, one more time, major drops of more than a 30% during the past six years, that is to say, during the current decade. However, it must be noted that in cases such as the ones of Spain, Cyprus, Italy and even Ireland, whose economy has also been in the eye of the storm, most of the revenue decrease took place during the first years of the analyzed period. As for Greece, this country underwent some years with no public service media organizations at all, so there are no data available for the years 2012 and 2013. Once again, the Northern Europe countries, mostly the Scandinavian ones and the powerful economies of Germany, the United Kingdom and France, show a more stable evolution of their revenues in relation to the number of households. However, and as it is depicted by the eu average, there has been a certain trend to the reduction of this indicator, which can be explained by the fact that, against the stagnation of psm funding during this period, the number of households in the European Union has grown in almost 10 million, going from less than 210 million households in 2012 to almost 220 million in 2016, according to data retrieved from Eurostat. As it has already been pointed out, this analysis is especially relevant because most of the countries with a licence fee model apply this kind of tax to households. In the year 2016, 17 countries of the European Union were using this kind of public funding source for their psm organizations, as it can be observed in Graph 4. The average European licence fee was 135,2 euros per household, very close to the figure of the revenues of the psm organizations per household, 146,2 euros. 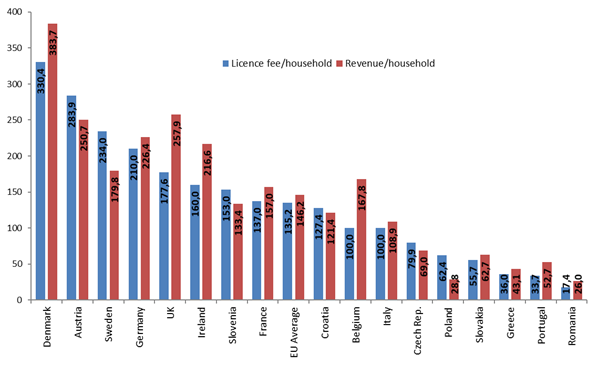 It should be noted that almost every country shows a remarkable closeness between the licence fee per household figures and the revenues of psm organizations per household, except for some noteworthy exceptions, such as the one of Belgium, where there is some kind of distortion because the licence fee is only applied in the French Community, and not in the Flemish Community. Lastly, it is necessary to relativize the revenues of the public service media organizations in relation to the size of the economies of each country. 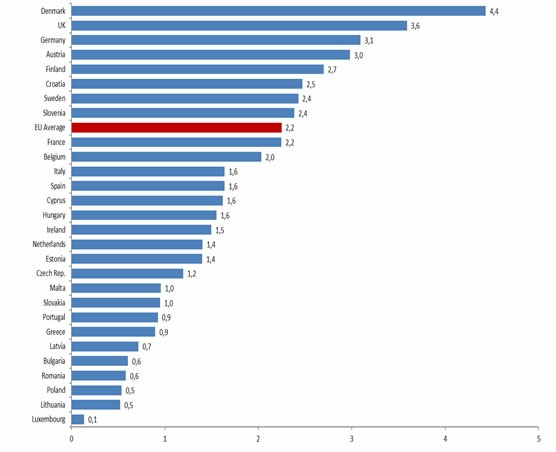 To do so, the data retrieved from the European Audiovisual Observatory about psm income have been put in relation with the respective values of their Gross Domestic Product (gdp) in terms of Purchase Power Parity (ppp) provided by Eurostat, as this value better depicts the size of the different national economies analyzed in this study. The European Union average is 2,2 euros out of each 1000 gdp in ppp in 2016. This value has been remarkably eroded during the analyzed period, as in 2010 the figure was 2,6 euros out of each 1000 euros of gdp in ppp, as it is shown in Table 5. Thus, it can be observed how a narrow group of countries have figures above the European average. Those are, once again, the Northern Europe countries, such as Denmark, Finland and Sweden, as well as the United Kingdom and Germany, but this time Austria, Croatia and Slovenia are found among this group too. By contrast, another group of countries can be found way below the European average, with figures that oscillate around 1,5 euros per each 1000 gdp in ppp. 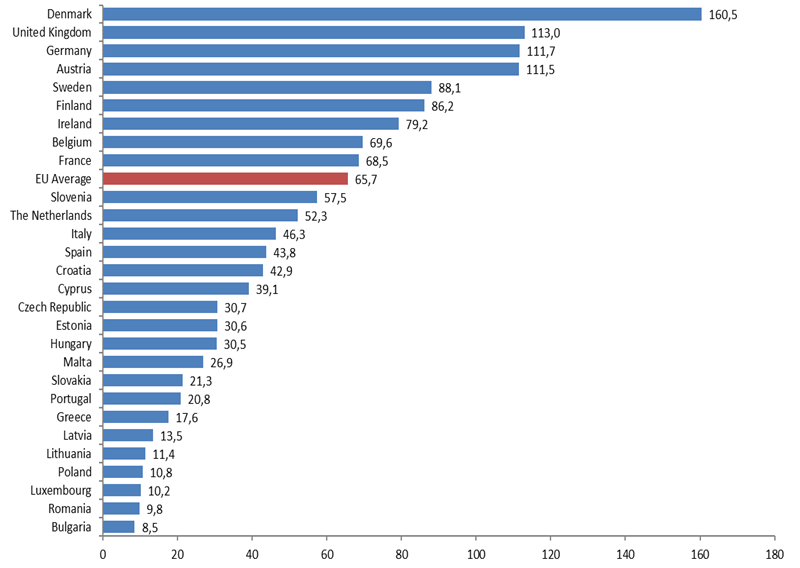 Economies of relative power as Spain and Italy, as mentioned before, are part of this group, along with Ireland, the Netherlands, and even Belgium are ranked below the European average, as shown in Graph 5. 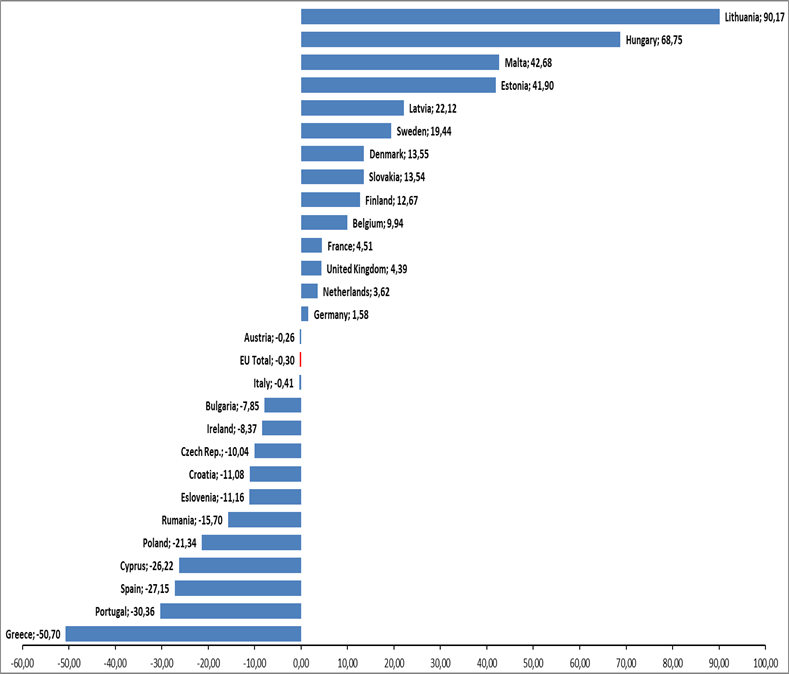 Nevertheless, in this case it should be highlighted that, even if the most important drop in the European countries as a whole takes place during the first three years of the studied period, the data of the second period, that is to say, between 2013 and 2016, also depict a major decrease in most of the countries. In fact, the European average experiences a 6,7% drop in this triennial after the 8,2% decrease between 2010 and 2013. As the analysis developed in the previous sections showed that, as a general trend, the revenues of public service media organizations between 2013 and 2016 were aiming at a certain stability and even to a certain growth, it becomes clear that the drop on the revenues in terms of gdp in ppp can be explained by a most intense increase in this variable; that is to say, as the European economies have abandoned their stage of economic recession and have gathered certain growth, such growth was not proportionally transferred to the budgets of public service media organizations. Therefore, it could be stated that the financial crisis brought a major impact on the resources available for this public organizations through revenue cutbacks both in public funding and in other income sources, such as advertisement, which does not seem to experience an equivalent recovery in the following period of economic recovery, at least not in the same extent and proportion. The impact of the financial crisis, the changes affecting media production, distribution and consumption models and the constant increase on the questioning of their legitimacy have placed public service media at a crossroads that calls for the adaptation of the different funding models found in the European Union. Direct subsidy from general budgets has been widely questioned because of the room it leaves for political interference. This influence could be mitigated through the establishment of specific amounts for closed periods, a measure that would also bring more stability. Countries like Finland and Germany have already reacted to the crisis of the most widespread funding system in Europe, the licence fee, extending it to all citizens through a progressive tax, in the first case, and to all households, in the second. The proposal to include crowdfunding for the allocation of funds to public service media organizations also appeals to the reflection on the update of funding schemes that respect the principle of universality. The stagnation of public service media funding in the European Union during the analyzed period reveals the need for a reformulation of business models, valuing the need of such services with regard to criteria such as legitimacy, independence, quality, reputation and trust. Even if the evolution of the funding figures in the current decade, as it has been pointed out, show in the European Union average certain stability or stagnation, this must not hide the major differences in the allocation of resources and the consolidation of public service media between the strong model of the Northern countries and the weakness shown by Southern Europe in this analysis. Anyway, two different stages can be detected within the analyzed period between 2010 and 2016. The first triennial would correlate to a first stage of clear and major budget reductions in many countries, coinciding with the recession that was hitting Western economies during these years. A second triennial, between 2013 and 2016 depicts, in general, how the funding of European public service media organizations has improved, both in the European average figure and in most of the countries of the analyzed sample, even though this improvement is deemed moderate if compared to the major drops of the previous period in some countries. The analysis in reference to households and inhabitants of the countries of the study depict very similar conclusions. The regular concept of a two-speed Europe, that is to say, the gap between the strong Norther Europe and the weak Southern Europe, is clearly shown on the analysis of the disposition and stability of the revenues that fund public service media organizations. These same conclusions are reached when considering the size of the economies, even though in this case a certain stiffness is revealed when increasing the revenues of public service media organizations in the stage of economic upswings, contrasting with the little resistance to adjustments that affected such funding during the previous stage of economic recession. This evidences the need for a renewed funding model that addresses questions of predictability, independence, trust and legitimacy for the public service media system to be sustainable over the medium to longer term. * Funded research. The results of this work are attributable to the project “Indicadores de gobernanza, financiación, rendición de cuentas, innovación, calidad y servicio público de las RTV europeas aplicables a España en el contexto digital” (Reference CSO2015-66543-P) of the State programme Fomento de la Investigación Científica y Técnica de Excelencia, statal subprogramme Generación de Conocimiento of the Ministry of Economy and Finance of Spain, co-financed by the European Regional Development Fund (FEDER) of the European Union. The author Marta Rodríguez-Castro has an FPU contract under Grant FPU16/05234. Y Achille (1994): Les Télévisions publiques en quête d’avenir. Grenoble: Presses Universitaires de Grenoble. R Benson & M Powers (2011): Public Media and Political Independence: Lessons for the Future of Journalism from Around the World. Nueva York: Free Press. CE Berg & AB Lund (2012): “Financing public service broadcasting: A comparative perspective”, en Journal of Media Business Studies, 9(1), pp. 7–22. T Bonini & I Pais (2017): “Hacking Public Service Media Funding: A Scenario for Rethinking the License Fee as a Form of Civic Crowdfunding”, en International Journal on Media Management, 19(2), pp. 123–143. A Brown (1996): “Economics, public service broadcasting, and social values”, en Journal of Media Economics, 9(1), pp. 3–15. Comisión Europea (2009): Comunicación de la Comisión sobre la aplicación de las normas en materia de ayudas estatales a los servicios públicos de radiodifusión. Bruselas: Comisión Europea. Comisión Europea (2017): Libro blanco sobre el futuro de Europa. Reflexiones y escenarios para la Europa de los Veintisiete en 2025. Bruselas: Comisión Europea. T Coppens & F Saeys (2006): “Enforcing performance: new approaches to govern public service broadcasting”, en Media, Culture & Society, 28(2), pp. 261–284. V Crespo-Pereira, VA Martínez-Fernández & F Campos-Freire (2017): “La neurociencia para la innovación de contenidos en la televisión pública europea”, en Comunicar, XXV (52), pp. 09-18. Department for Culture, Media and Sport (2015): bbc Charter Review. Public Consultation. Londres: Department for Culture, Media and Sport. K Donders (2010): “The benefits of introducing European competition principles into national public broadcasting policy”, en info, 12(6), pp- 56–68. EBU (2017): Public Funding Principles for Public Service Media. Grand-Saconnex: ebu. C Herzog & K Karppinen (2014): “Policy streams and public service media funding reforms in Germany and Finland”, en European Journal of Communication, 29(4), pp. 416–432. O Hultén (2003): “Value for money: Auditing public broadcasting performance in Sweden”, en Javnost - The Public, 10(3), pp. 97–108. Ó Juanatey-Boga, VA Martínez-Fernández & P Castellanos (2017): “La edición en papel de la prensa local ante el fin de su ciclo”, en Estudios sobre el Mensaje Periodístico. 1 (23), pp. 91-100. K Karppinen & H Moe (2016): “What we talk about when talk about ‘media independence’”, en Javnost - The Public, 23(2), pp. 105–119. J Lewis (2015): “Future of the BBC: why the ‘market failure’ model is a flop in broadcasting”, en Media Policy Project Blog, London School, Agosto: https://goo.gl/WnqhWm. GF Lowe & CE Berg (2013): “The Funding of Public Service Media: A Matter of Value and Values”, en International Journal on Media Management, 15(2), pp. 77–97. GF Lowe & J Bardoel (2007): “From public service broadcasting to public service media. The core challenge”, en vv aa, From public service broadcasting to public service media (Eds., GF Lowe y J Bardoel). Gotemburgo: Nordicom. H Moe (2011): “Defining public service beyond broadcasting: The legitimacy of different approaches”, en International Journal of Cultural Policy, 17(1), pp. 52–68. Ch S Nissen (2006): Public service media in the information society. Estrasburgo: Consejo de Europa. OEA (2017): Yearbook 2016. Estrasburgo: Observatorio Europeo del Audiovisual. P Ramsey (2017): “Public service media funding in Ireland faces continuing challenges”, en Media Policy Project Blog, London School, Septiembre: https://goo.gl/1jQkMB. M Rodríguez-Castro (2017): “Public Value Test. La adaptación de la gobernanza a los nuevos medios”, en vv aa Estudios sobre legislación, financiación e innovación en la Televisión Pública (Eds., M Túñez López, F Campos Freire y A Silva Rodríguez). La Laguna: Latina. vv aa (2011): Exporting the public value test. The regulation of public broadcasters’ new media services across Europe (Eds., K Donders y H Moe). Gotemburgo: Nordicom. Article received on 23 December 2017. Accepted on 20 May. Published on 26 May 2018.